Lyra Music is a non-profit classical music organization directed by Akiko Sasaki and Rachel Odo that combines a world-class music festival with a nurturing, conservatory-style summer music program for young pianists and string players. 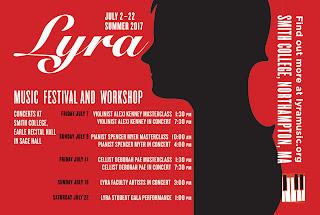 The 8th Annual Lyra Music Festival offers participants and the community an exciting chance to hear and work with some of the most compelling classical music talents of our time. Lyra Music is grateful to the Northampton Arts Council, Mu Phi Epsilon, the Seligman Foundation and all of the private donors who make it possible to bring classical music to life everywhere. Hear Lyra Music Workshop’s outstanding young violinists perform excerpts from the repertoire and get an intimate look at the process of training and development as they work with Mr. Kenney, Lyra Music Festival Guest Artist and recipient of a 2016 Avery Fisher Career Grant. “A talent to watch”, Alexi Kenney, recipient of a 2016 Avery Fischer Career Grant brings a solo violin recital of works by Bach, Ysaye, Enescu and conductor/composer Esa-Pekka Salonen, to the Lyra Music Festival Stage. Mr. Myer works with the talented young musicians of the Lyra Music Workshop on classical piano repertoire. Enjoy outstanding live young artist performance and experience the training process. Lauded for his “superb playing” and “poised, alert musicianship”, pianist Spencer Myer joins the Lyra Music Festival with a wonderfully diverse program including: Haydn, Chopin, Ravel and Bolcom’s Four Rags. 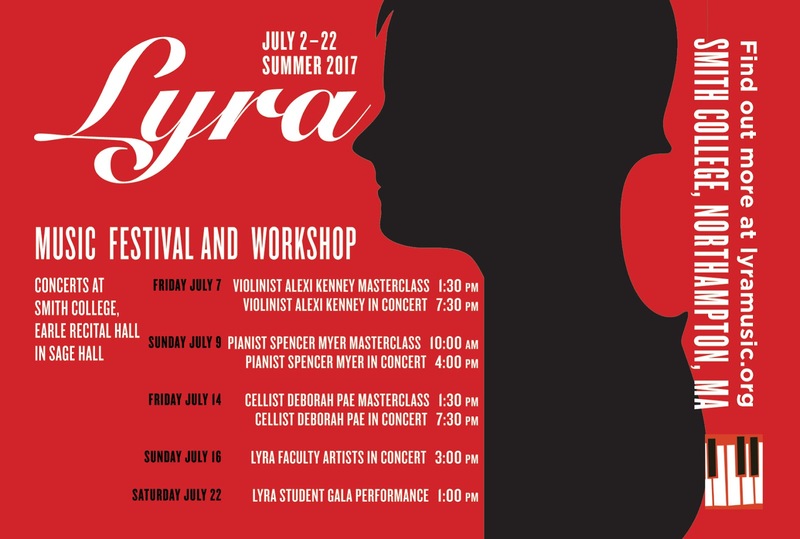 Join us for Lyra Music Workshop cellists in Master Class with Guest Artist, cellist, Deborah Pae. Hear their performances and watch as Ms. Pae shares the legacy of classical music with this new generation. An evening of Beethoven, Brahms, de Falla and Mumford with Lyra Music Guest Artist, cellist, Deborah Pae. “Exceptionally gifted” and “breathtaking”, Ms. Pae will be performing with Lyra Music Faculty collaborative pianist, Vanessa May-lok Lee. An afternoon of chamber and solo works by Debussy, Franck, Vieuxtemps and Francaix. Lyra Music Faculty Artists: Ye-Jin Han, Julia Kang, Nathaniel LaNasa, Vanessa May-lok Lee, Peter Rovit and Lyra Music Artistic Director Akiko Sasaki. Join us for a "just-right" concert performed by kids for kids as the talented musicians from Lyra Music Workshop's Young Artist Program, Lyra Workshop Core Curriculum and the Lyra Music Faculty perform Saint-Saens' Carnival of the Animals. This family-friendly concert includes a video installation incorporating the beautiful work of children’s book artist, Eric Carle, and will be followed by an instrument petting zoo with Stamell Stringed Instruments – try a violin, viola or cello for yourself! An exceptional program of solo and chamber repertoire performed by Lyra Music Workshop’s talented young musicians. Tickets purchased in advance, online, provide access to the reserved seating section.